John Constable is recognised as one of the great English Romantic landscape painters and many of his paintings are of rivers. 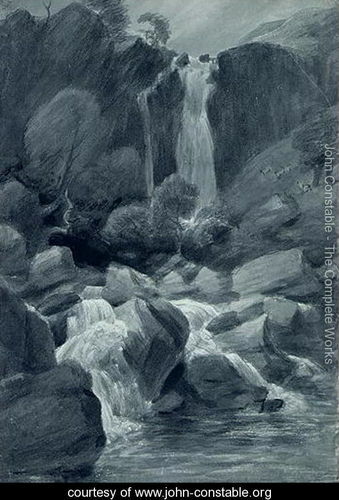 In a slightly tongue-in-cheek post I want to explore the geomorphology of some of his chosen subjects to demonstrate that the areas he painted were almost exclusively human modified landscapes of questionable geomorphological sustainability and to ponder how these idealise landscape images have shaped the English psyche as to what sort of river landscape is perceived as “natural” and valuable. The first painting I’ve chosen is arguably his most well-known; The Haywain (1821). This shows the eponymous subject crossing a fording place near to a mill so this already indicates there is human modification. 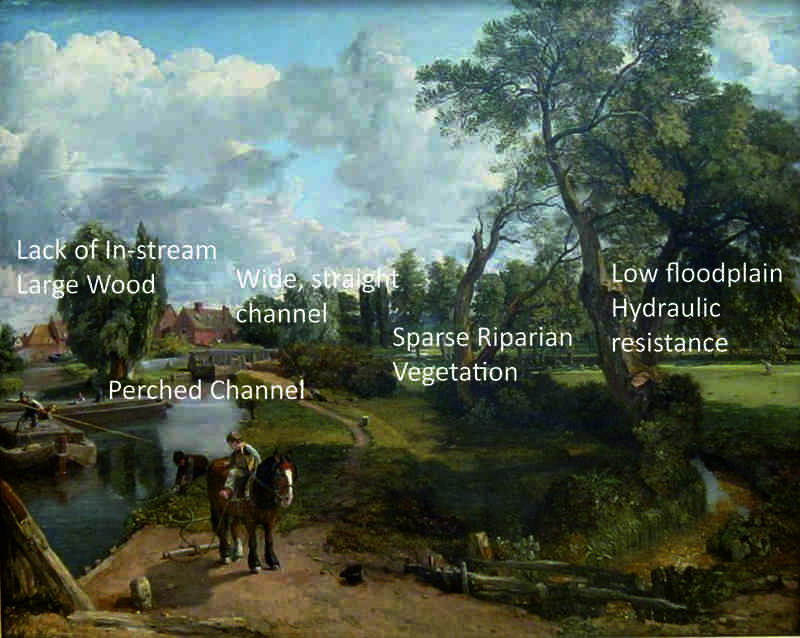 Looking in more detail at the ecology we can see that in common with many of Constable’s landscapes he’s chosen an area mostly devoid of riparian woodland, showing trees as just a thin bankside strip. Despite the obvious age of some of the trees there is no obvious dead wood in the channel suggesting possible removal by “river managers”, especially given the wide channel at this point which is likely a zone of deposition due to the drop in velocity so we would expect the presence of wood here. This wide channel is the key to the geomorphology of this area – the crossing by livestock and wagons seems to have caused overwidening of the channel; this causes stream velocities to slow in the larger, shallower flow and promotes sediment (and wood) deposition. This deposition appears to be possibly causing the channel margins to become choked with fine sediment. The second painting is “The valley of the Stour with Dedham in the distance” (ca. 1800). This is fairly typical of Constable’s wide landscape views from Essex and Suffolk. It shows a lowland river meandering through its floodplain and as with The Haywain shows riparian and floodplain woodland as very sparse or non-existent. With the Mill in the foreground providing a pinch-point and the bridge piers downstream we could expect this to be an area of scour and erosion (due an increase in velocity through the narrower sections), with corresponding deposition immediately downstream (as flow slows again), either as a bar, or possibly at the inner bank of the next meander. This will possibly cause an erosional “push” creating increased erosion against the outer bank and meander migration into the floodplain on the left behind the mill. Indeed close examination reveals the bank here to be painted light brown rather than green indicating this process may be occurring. River management at this period would likely attempt to strengthen the bank here, rather than identify and address the root problem of the upstream pinch-point. The third painting is “Flatford Mill” (1816). Flatford is on the Essex/Suffolk border and is similar to the previous two paintings in that the channel is modified for navigation, although here we see the full expression of that in locks, tow-paths and a perched, reinforced, straightened channel. Although a beautiful painting it is interesting to consider that many people would consider this a typical English pastoral scene, when in reality it is no more or less industrial than the iconic paintings of Lowry. The fourth painting I’ve chosen to look at is “Helmingham Dell” which is one of the more natural landscapes; showing a small stream. 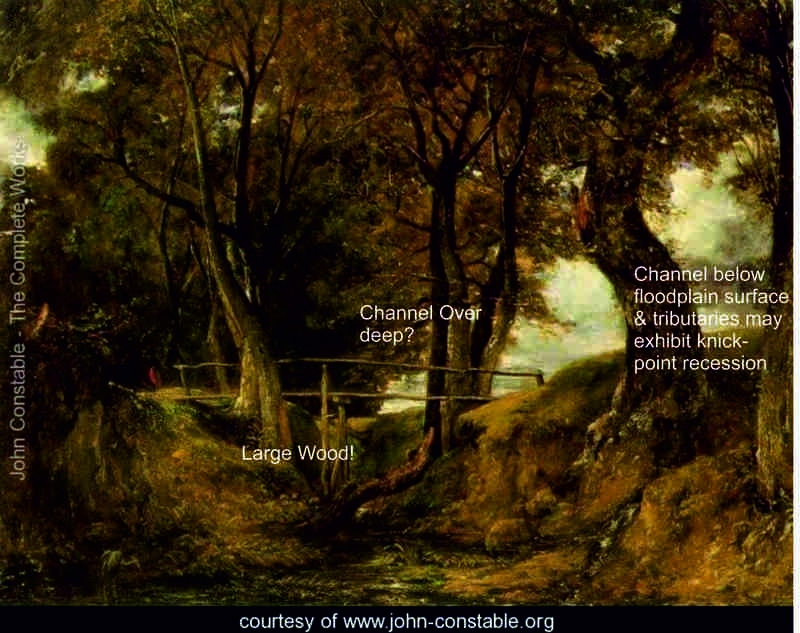 This painting is a personal favourite as it is the only Constable painting in which in-stream large wood is portrayed. A closer examination of the topography reveals all may not be as natural as it initially seems however. The banks seem very steep and high and composed of fairly soft sediments (as opposed to bedrock for example), it seems unlikely the stream shown would cut such a deep channel below the floodplain surface of these dimensions. We could imagine if this channel evolved over time the “valley” would be more classically v-shaped. Geomorphologically such a channel could be possible if there was either fairly rapid (geologically) base level lowering or tectonic uplift. Given that Suffolk was relatively tectonically benign in the later part of the second millennium BC this leaves only the possibility of base-level lowering or human cutting of the channel. It is possible the dell drains into a pond or lake which has been drained resulting in a lowering of the stream base level and caused knick-points to migrate up the channel through the dell causing down-cutting, but I think it more likely the channel was artificially deepened in the <50years pre-painting, and as little as 20 years. There is one small tree of ~20 years old growing in the base of the dell, where-as all the other trees are older specimens. Furthermore the tiny tributary on the right seems to be experiencing knick-point recession and cutting backwards into the floodplain surface, indicating relatively recent modification. The final painting is from a set Constable painted in the Lake District and represents one of the few “natural” landscapes. There is a serious point behind this evaluation, which is the public perception of river “naturalness”. Modern river managers in the UK often come up against stakeholder perceptions of what a river should look like in relation to trying to manage rivers in a more sustainable way. It is just possible that in edifying great landscape art we confuse the technical and aesthetic achievement with the desirability of the subject matter. Interestingly the American tradition of romantic landscapes coincided with the opening up of the American West and thus often (e.g. Bierstadt) features relatively pristine landscapes. 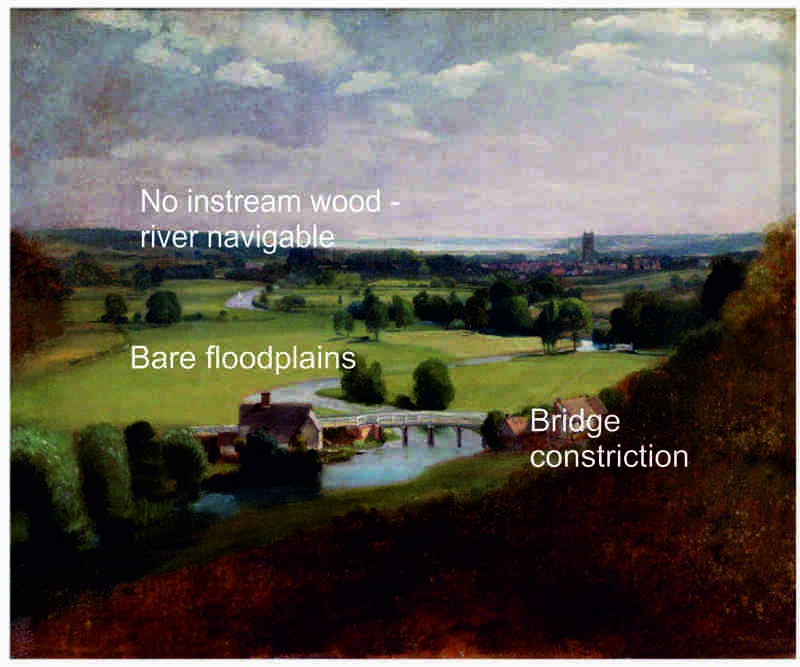 For river managers it is important to recognise when encountering resistance to a river restoration scheme, or a campaign for more dredging, it may not be just a question of arguing a technical position, but of acknowledging you may be working against the perceptions resulting from over 200 years of English romantic landscape painting. This entry was posted in Anglian, Chalk streams, Ecology, Geomorphology, Hydrology, River Management, River restoration. Bookmark the permalink. Great post! With your permission, will link it in my blog. What a neat analysis! Now I have to run to the museum! Love this too, especially that you have drawn a comparison with Lowry. I do think there is great value in reassessing what he was trying to depict in his paintings, particularly as his father owned and ran two mills and he worked for him for a time.